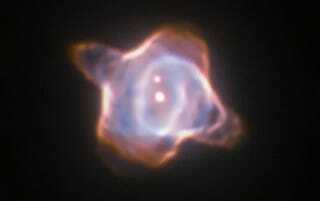 At the heart of the Stingray Nebula some 2,700 light years from Earth lies a small, aging star known as SAO 244567. Astronomers have been observing it on and off for decades, and they can now confirm they’ve witnessed something amazing: a never-before-seen stellar rebirth. From 1971 to 2002, the surface temperature of SAO 244567 skyrocketed, from 20,000 to nearly 60,000 degrees Celsius. At the same time, the star contracted, shrinking from about four times the size of our Sun to just a third of its diameter. Now, observations made with the Hubble Space Telescope reveal that the star has begun to cool off and expand again, its surface temperature waning to a tepid 50,000 degrees Celsius in recent years. What on Earth is going on here? Nicole Reindl, an astronomer at the University of Leicester who has been studying SAO 244567 for years, believes we’ve just witnessed the before and after of a “helium flash,” an unusual astronomical phenomena believed to occur during the red giant phase of certain low-mass stars. Essentially, as the hydrogen in the star’s core is exhausted, helium waste is left behind, increasing the temperature and density of the core until it it becomes hot enough for helium to burn. Then, you get the flash—a brief but incredibly intense period of helium fusion that causes the star to expand and brighten considerably. “The release of nuclear energy by the flash forces the already very compact star to expand back to giant dimensions—the born-again scenario,” Reindl explained in a statement. It’s not the first time astronomers have studied such a star, but it is the first opportunity we’ve had to witness both the heating and cooling phases of this kind of transformation. The processes of stellar evolution typically play out over millions to billions of years. Getting to watch a star evolve in mere decades reminds just how dynamic our cosmic neighborhood is—and how little we truly understand about the forces shaping it.